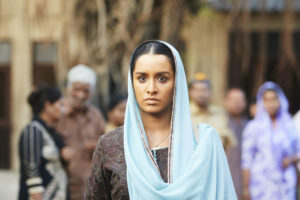 Shraddha Kapoor who will be seen playing the role of Haseena Parkar went through an huge personality change to get into the nuance of her bold character. Shraddha who has garnered a lot of appreciation for her look as Haseena, is known to be a happy & fun person. During the shoot of the film she almost scared a friend of Apoorva Lakhia with her entire personality. While shooting Haseena Parkar, Shraddha would spend a lot of time alone to keep an intense personality which was required for her character. Not only did the actress gained few pounds for the film she also went through an entire voice modulation process to get the deep voice like Haseena. To make sure that in all her scenes she had the same voice, she would talk to the entire set in that deep voice. Once on an intense shoot day, when director Apoorva Lakhia had his friend come on set. He was introduced to Shraddha and after his first interaction with the actress, he was rather taken aback. Contrary to her lovely nature, the actress maintained her deep voice in front of the director’s friend which almost scared him. Apoorva had to explain his friend about the reason Shraddha sounded the way she did which eventually become a joke with lot of appreciation for the hard work the actress has put into her character. 15 queries in 1.276 seconds.